Kara Cenar takes lead trial and litigation roles in important and complex intellectual property matters for domestic and international companies of all sizes, as well as individuals. She handles the enforcement of IP rights and the defense of alleged violations of the IP rights of others. 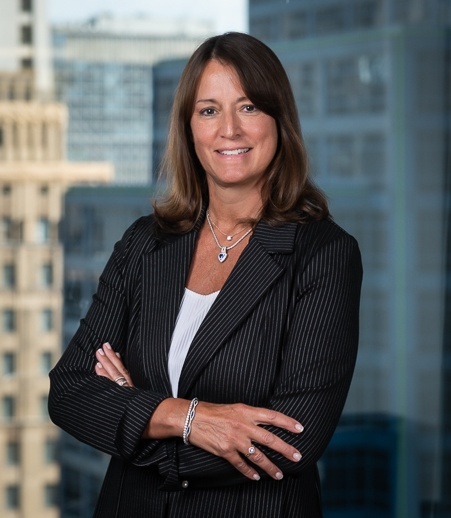 Kara Cenar combines decades of counseling, trial and litigation experience with practical business applications to assist clients in matters involving technology, patents, design patents, trade secrets, copyrights, trade dress and trademarks. Kara’s practice also involves counseling and assisting individuals and businesses with intellectual property rights, business issues, and litigation connected with the 3D printing and additive manufacturing emerging technology, including international businesses in this industry seeking to do business in the United States. Kara takes lead trial and litigation roles in important and complex intellectual property matters for domestic and international companies of all sizes, as well as individuals. She handles the enforcement of intellectual property rights and the defense of alleged violations of the intellectual property rights of others. In her 29 years as a trial lawyer, Kara has focused entirely on intellectual property cases. Her experience includes jury and bench trials, preliminary injunction hearings, hearings on emergency temporary restraining orders, seizure and impoundment orders and Section 337 claims before the International Trade Commission. She formulates litigation strategy for pre-trial litigation, discovery and pre-trial motions. Additive Manufacturing and 3D Printing. This emerging technology involves a combination of intellectual property and other domestic and international design, manufacturing and distribution-based experiences. Kara’s background in representing domestic and international companies in IP-based litigation in the automotive, automotive after market parts, medical device, medical simulation technology, dental tool and accessory and furniture design industries provides an industry knowledge base for companies implementing additive manufacturing and 3D printing. Kara has specific litigation experience involving the taking, distribution and misuse of CAD drawings and other digital and technical engineering-based drawings, as well as the removal and replacement of copyright management information from such drawings in an international manufacturing and collaborative relationship context. Such claims encompassed patent, trademark, copyright, DMCA, and trade secrets matters; breach of confidentiality agreements; and CISG (Contracts for the International Sale of Goods), as well as core investigative skills involving metadata and other forensic computer, software and electronic evidence and the downloading, transmission, copying and storage of the same across international lines. Helping individuals and businesses identify and secure IP rights for innovations in the additive manufacturing and 3D printing industry. Drafting, negotiation and review of contracts, non-disclosure and confidentiality agreements, as well as a variety of agreements between businesses entering into collaborative relationships. Drafting, negotiation and review of contracts, non-disclosure and confidentiality agreements for businesses looking to directly implement additive manufacturing and 3D printing into their manufacturing processes to ensure IP and other rights are appropriately addressed and in line with a company’s business objectives. Assistance to clients seeking to start up or expand businesses that complement or serve segments of the emerging additive manufacturing and 3D printing industry. Pursue or defend IP-based litigation claims and defenses (patent, trademark, copyright, DCMA and trade secrets) as well as business and contract-based litigation claims for this industry. Trade secret technology for stators and manufacturing processes for stators in the hybrid automotive industry. Trade secret chemical formulas for flavors and fragrances for the food industry. Trade secret chemical formulas for defoamers for the paint industry. Trade secret customer lists for the tool industry. Trade secret pricing and customer information for the propane industry. Copyright. Kara has led litigation matters involving CAD and digital technical and engineering drawings, manipulation of copyright management information associated with copyrighted works under the DMCA, musical works (musical composition, musical compilation, and sampling claims), digital music, literary works (books and educational materials), sculptural arts and software. Patent Infringement. Kara has handled major, complex jury and bench trials, ITC proceedings and litigation involving patents covering medical and surgical devices, medical simulation devices, dental instruments, Internet, computer and software technology, telecommunications, cellphone technology, gift and debit card technology, automotive parts and replacement parts, and electronic and mechanical devices. Design Patent Infringement. In the area of design patent infringement litigation, Kara has been involved in litigation concerning the automotive after-market parts, consumer products and power tool industries. Trademarks and Trade Dress. Kara has vast experience in the enforcement and defense of trademarks and trade dress. Her experience has been in a variety of industries and includes representation of famous and distinguished brands. Trademark clearance opinions and searches. Counseling and monitoring to confirm that intellectual property rights are used properly and effectively. Negotiating and drafting licenses, agreements and transactions related to the rights obtained, domestically and internationally. Providing opinions and establishing policies and procedures for individuals and companies to avoid conflict with the intellectual property rights of others. Successful enforcement of trade secret rights on behalf of an Italian manufacturing supplier to the automotive industry and hybrid automotive industry, resulting in a $32 million payment in settlement and a dismissal with prejudice of all claims against the client. Successful defense of a patent infringement case involving medical simulation devices, four patents and multiple international defendants, including obtaining a transfer out of the Eastern District of Texas. $17+ million jury verdict and permanent injunction, plus an ongoing royalty payment during a transition period in patent infringement litigation involving four touch-screen user-interface patents for hemodialysis machines and related disposable products in the Northern District of California. Judgment of non-infringement (affirmed by Federal Circuit) in patent infringement bench trial litigation in the Eastern District of Pennsylvania involving methods of making inserts and transducer activated tools for ultrasonically activated tooth-cleaning tools. Defense of retailers against industry-wide assertion of claims of patent infringement involving gift card technology in the Northern District of Illinois. Defense of allegation of patent infringement of internet cookie technology and internet standards, including the impact of such royalty-free arrangements on a reasonable royalty analysis. Successful defense of litigation brought by non-practicing entities. Litigation involving copyright and other IP rights for video reel casino slot machine games, for land based casino slot machine games and slot machine games in the social, mobile and online industries. Litigation involving claims for the taking, distribution, misuse of CAD drawings and other digital and technical engineering based drawings as well as the removal and replacement of Copyright Management Information from such drawings in an international manufacturing and collaborative relationship context. Successful defeat of an ex parte application for a temporary restraining order and later request for preliminary injunction in a highly publicized alleged music copyright infringement and sampling case pending in the Central District of California. Obtained summary judgment findings of no infringement based upon a finding of no substantial similarity as a matter of law in a music copyright composition claim pending in the Central District of California. Obtained dismissal of a music copyright case based upon despoliation of evidence. Defeated a request for preliminary injunction and then obtained a summary judgment finding of no substantial similarity in a highly publicized alleged music copyright infringement case filed first in the Northern District of Illinois and later in the Central District of California. Obtained an award of about $2.5 million in attorneys’ fees against a plaintiff that brought a copyright claim shown to be without basis and in which the plaintiff was found to have destroyed evidence. Obtained dismissal of a lawsuit and settlement of a claim of copyright infringement against a book author and publisher in the District of Georgia. Enforcement of a brand owned by a small business against a large international upcoming brand. The case included complex issues of common law, federal and state trademark ownership rights and their geographic scope, progressive encroachment, licensee estoppel defense, disgorgement of profits in reverse confusion cases, willfulness, invalidity of federal registrations including issues of registrations being found void ab initio, and issues relating to fraud on the trademark office post-In re Bose. Successful defense of request for entry of an emergency temporary restraining order involving claims of alleged counterfeiting against a retailer. Obtaining a product design change and change of trade show materials related to an ultrasonic dental scaler instrument after filing an emergency motion for a temporary restraining order before the District Court in the Northern District of Illinois. Permanent injunction and consent judgment enjoining false advertising, trademark infringement, product misbranding and false patent marking for clothing in the District Court in the Northern District of Illinois. Mediation before the U.S. Court of Appeals for the Federal Circuit in a stolen furniture design case. Permanent injunction and consent judgments of trademark infringement in complex multi-defendant federal, state and common law trademark infringement action before the District of New Jersey. Numerous negotiated settlements and resolution of patent, trademark, copyright, trade secret and litigation matters pending in federal and state courts nationwide. Developed and implemented strategies to avoid litigation and to enforce intellectual property without litigation. "Copyright and 3D Printing/Additive Manufacturing"
"3D Printing and Representation of Clients where Traditional Legal Principles Meet Emerging Disruptive Technology"
“Joint Defense and Indemnification [Getting Along with Others]"
Faculty, Practicing Law Institute "Current Trends for Selecting Expert Witness for Patent Litigation"